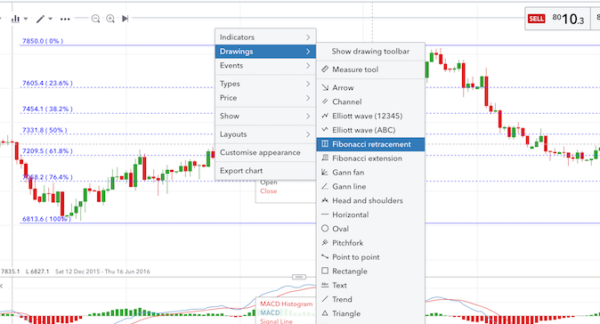 I have [as always] been looking at different trading ideas… and one that can be used with other indicators to create good short term trades is using the Fibonacci retracement tool on your charts. 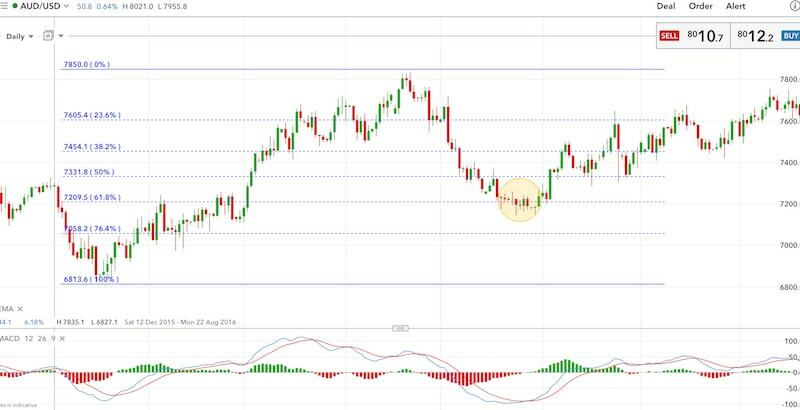 Using Fibonacci retracement trading to predict price movement can be very effective as a standalone system. However… if you add a MACD into the equation and use some simple reversal candle set-ups you have a complete system. For best results you will want to use at least the 4 hour candles or the daily candles. To draw the Fibonacci grid, you will need to go to your chart and go to drawings. You then just select the draw Fibonacci Retreatment. Then just drag the grid from the most recent low to the most recent high or vice versa. 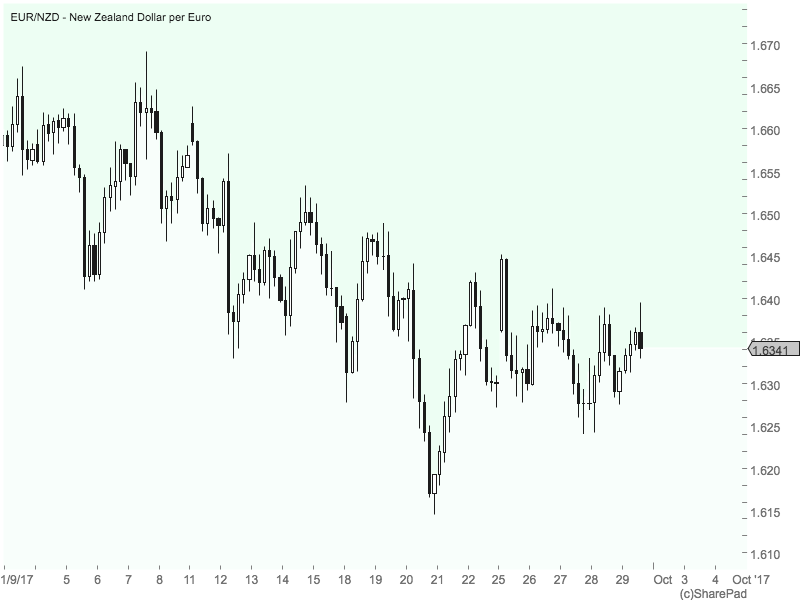 You can see from the next diagram of the AUD/USD that the most recent trend has seen the price move up. This means that we draw our Fibonacci retracement from 100% at the low of the trend to the 0% at the high of the trend. Now once the Fibonacci retracement grid is in place we are looking for a reversal candlestick pattern forming at the 50% level or the 61.8 level. You can use the 38.2 level but you will get more false signals. The 50% level has an amazingly uncanny knack of rebounding from this level, so it tends to be the level used by most traders. If the retracement goes past the 50% level and does not present a reversal candle set-up you will then wait to see if there is a reversal pattern formed at the next level. As you can see I have drawn the grid to illustrate how this strategy works. So I have drawn in the Fibonacci grid from the recent low to the recent high. I now wait to see if a reversal pattern forms at the 50% level, if not I will wait until a reversal pattern forms at the next level. Now if we scroll forward we can see what happens. 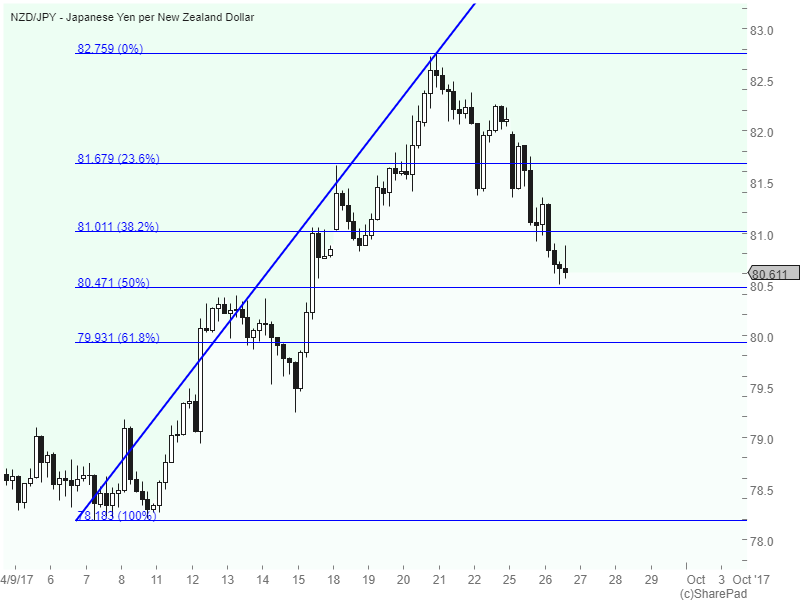 We can see that there was no reversal pattern at the 50% retracement level. So we wait and see what happens at the next level. Here at the 61.8 level you can see that the price action stops and there is very little movement. This is combined with a congregation of small doji, hammers and pinbar candles [highlighted and in line with MACD crossover]. 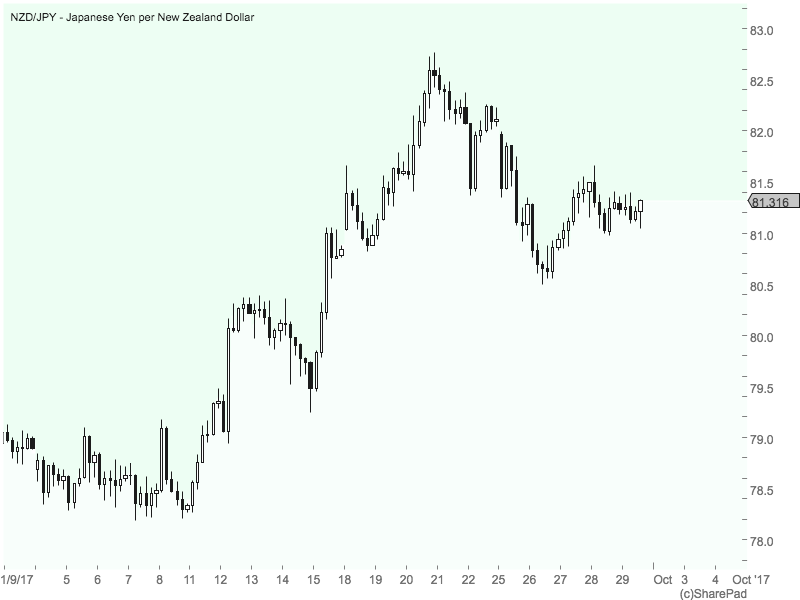 This is notifying us that a trade may be about to present itself. You can also read more about candle set-ups here. Also you can see that the MACD has given a crossover signal to further verify a change in market direction. Just after the MACD crossover we get a huge bull candle that signifies that the price is reversing and is going to resume the upward trend. We then enter our trade. A spread bet that nets us a nice stress free 150 points + profit or you could have made a binary bet. 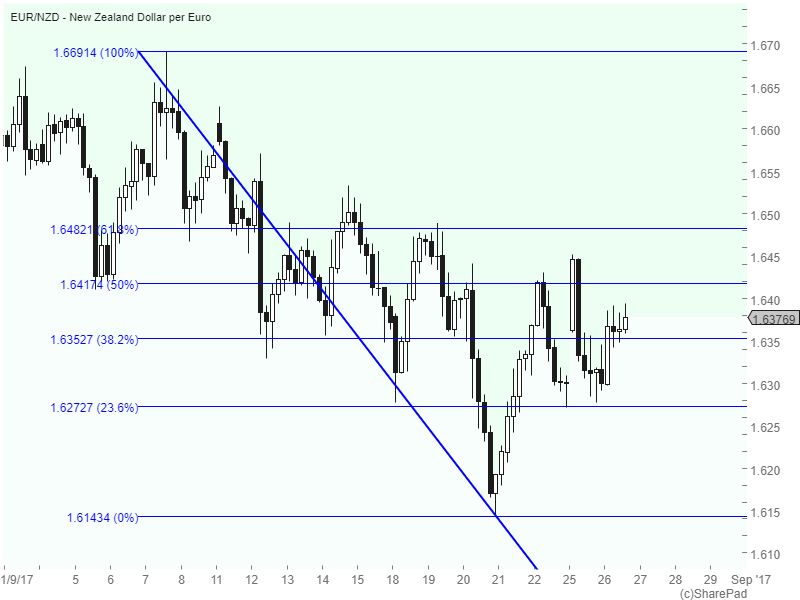 Draw your Fibonacci grid from the recent high to low or low to high. Wait for the retracement to reach at least the 50% level and confirm the reversal with a reversal candlestick pattern. If no pattern forms, then wait the retracement to reach the next level and again confirm reversal with candle patterns. Finally, the last confirmation to enter a trade is that the MACD has made a crossover. 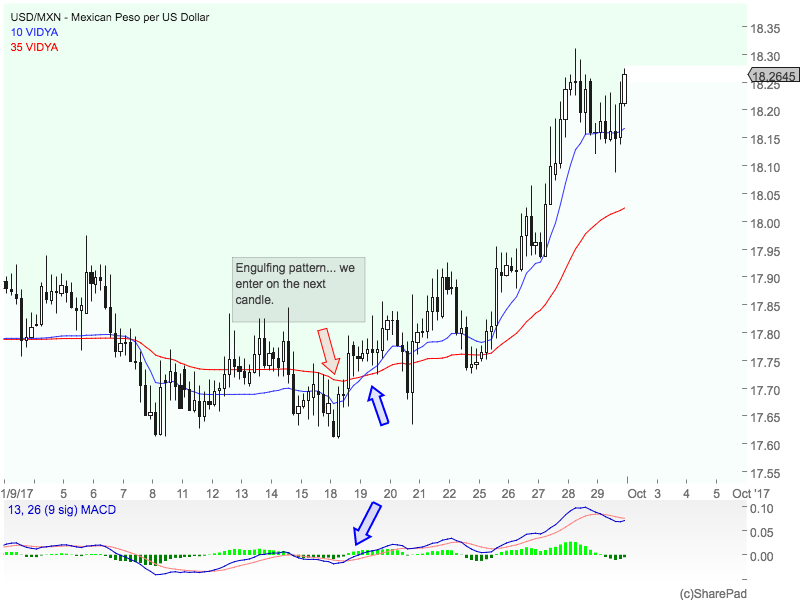 Once you get the hang of things you’ll be able to use just what you see on the charts to predict price movements. You will be able to remove the MACD and if you get really good then you will be able to gauge the Fibonacci retracements without the grid. Doing so is trading pure price action. A trait that is well worth acquiring. This [trading price action] is especially useful when trading currencies. Currencies tend to move in very noticeable patterns over time. 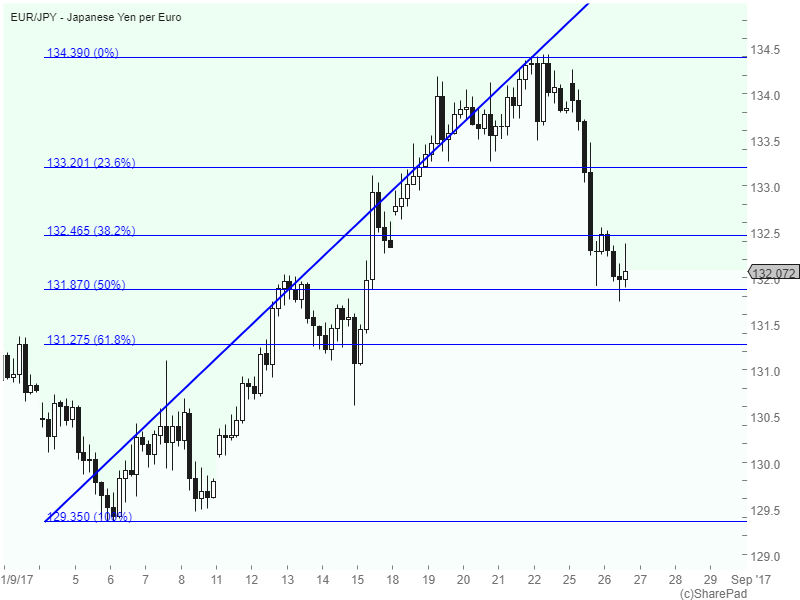 Here are some more charts that are approaching Fibonacci retracement levels. See if you can predict the next price movements? All the charts are from this September 2017. It’s not so important that you get the results right at this stage. It is more important that you see how the method works and get use to identifying the set ups. You can see the results beneath. I have removed the Fibonacci grid so that you don’t get confused. How did you get on? There is nothing complicated to this type of trading, most of it is mechanical so guesswork is eliminated. The good thing about learning to trade like this is that as I have already mentioned, eventually you will be able to eliminate all indicators if you learn well and wish to do so. 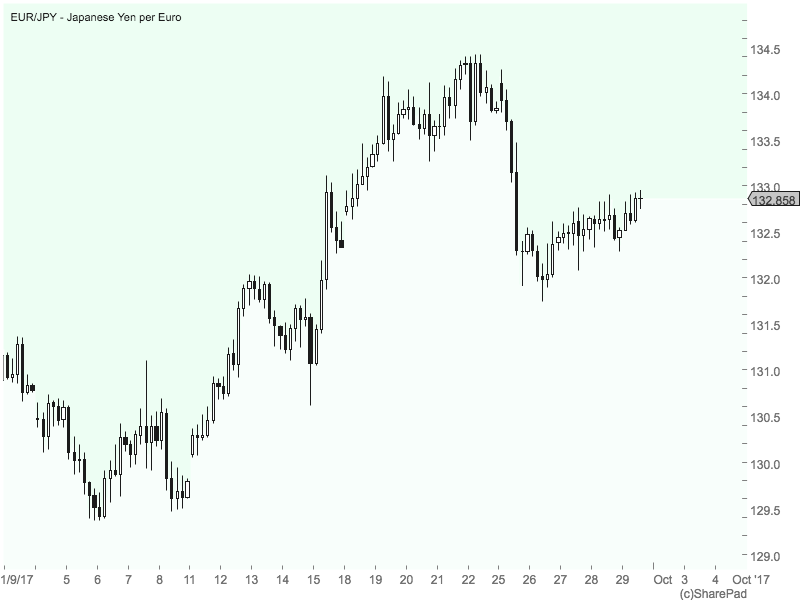 The key benefit from having a naked chart is that you are then reading the price action… the price does not lie. All chart indicators are lagging. So even though the information an indicator may give you can be useful, it is always dated. And it is not always as clear as the charts above. Look at this chart of the USD/MXN. Using price action and candle patterns we can see that after a down trend we then meet the same resistance again and a clear engulfing pattern is formed. By reading this, we then enter on the opening of the next candle. By doing so we get into the trade far earlier than the indicators suggest we should. If we had waited for verification from both the Moving Average and the MACD then we’d be getting on to the trade the following day or at least 20 ticks later. 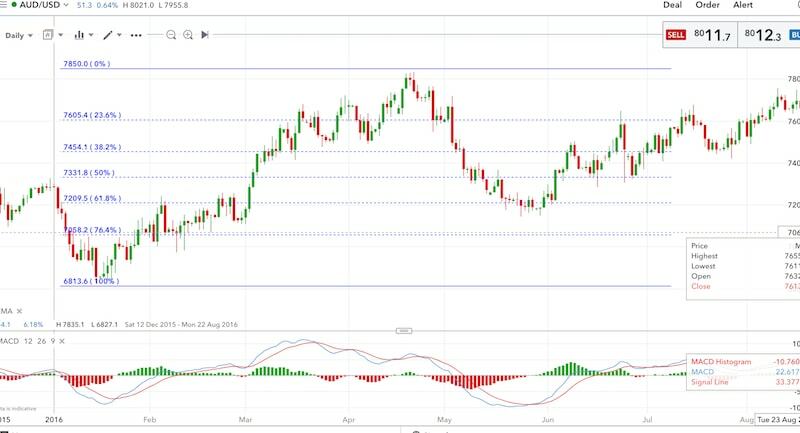 There are many benefits from learning Fibonacci retracement trading, and the reversal signals can be very accurate when combined with candle patterns. It is also a good way to start learning to read the price action rather than to keep relying on lagging indicators. Why do chart packages all differ?